Stay in town centre accommodation for your stag. So handy! Because no one likes a long walk back after the club. Karting: Can be organised for your group at one of Europes largest Karting tracks! 5-a-side soccer: If you rather play than watch for the afternoon! Poitín Distillery Tour & Tasting: Learn about the history of Poitin, the story of Micil and of course enjoy a tasting lads! Footgolf: Test your footballing skills with a round of footgolf. A brilliant option for footie mad stag! 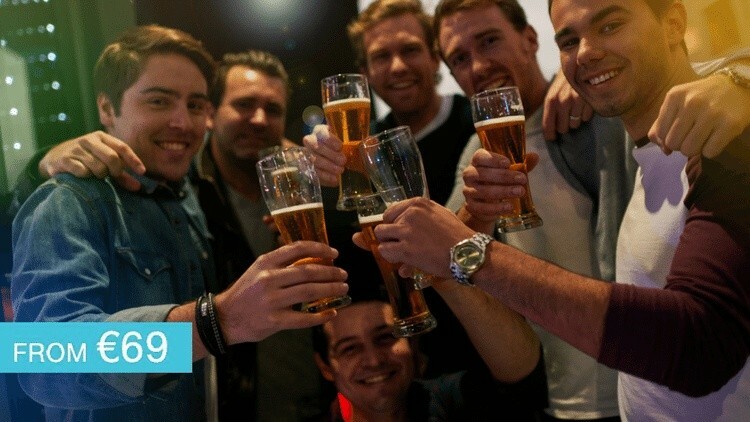 Afternoon of Sports: Enjoy the big matches in the comfort of the pub. So no excuse for missing the big game. Paintball: For any adrenaline junkies out there, this is the perfect activity for your group! Axe Throwing: Spend an afternoon learning the art of throwing an axe and unleashing their inner viking! Tag Archery: This is a combination of Dodgeball, Paintball and Archery its Mad Fun! Goggle Football: Its time to put on some vision impairing goggles and try to Score! Because the beer googles you already have isn’t hard enough. Bubble Soccer: One of the funniest activities to try for your Stag, think playing soccer in a zorb ball! Bubble Goggle Combo: Cant decide which? No Problem with this option you can split your time between both! A Night at the Dogs: enjoy an evening of betting and fun with this activity! Archery Darts: Basically it’s Darts played on an 8 ft Velcro Dart Board with Velcro Darts. Aim of the game is to hit the target, who has the best shot! How’s your accuracy? BattleZone Archery: Battle Zone Archery is an exciting fast paced activity that will keep everyone entertained. Teams face off against each other within the Combat Zone. Using specially designed bows and arrows their aim is to take down the enemy or targets in a series of challenges. The Stag Olympics: Enjoy 10 wacky activities, like a Dizzy Penalty Shootout and Throwing a toilet seat to name a few, that is the ultimate challenge on a Stag Weekend. Great craic from start to finish lads! Skill Zone: Spend 2 hours trying out loads of different sports. You get scored out of a 100 point for all the sports. The person with the highest amount of points wins. So do you think you have the sporting skills to win? 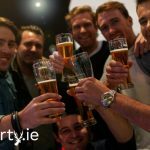 Party Boat: Why not have a fantastic trip around Galway bay on your Stag! Hurling/ Gaelic: Experience the thrill of both games with the Lads for the afternoon. Kayaking: A great activity to do for the Stag Party! Take a spin down the river in a Kayak! Fishing: Enjoy an afternoon spin fishing on rivers and lakes for salmon and trout! Shooting: try something new for your Stag Party activity! throwing the frisbee around the golf course! Chocolate, Gin & Whiskey Tasting: So indulge your taste buds, learn about fine Irish made gins, whiskeys and chocolate and how to pair them. A fantastic way to kick of the stag night. Brewery Tour: enjoy seeing beers being made with this activity! Also there will be a few tasters at the end. Zorbing: Just think big giant ball and you strapped in rolling down a hill. So much craic lads! Water Zorbing: Similar to Zorbing but with an added bonus of some water thrown in! Mountain Biking: A fun filled activity where you can test your limits and speed. Aran Islands Experience: Enjoy a day trip to the Aran Islands, take in all the pubs a guided tour and even stop off in another pub in Connemara on your way back to Galway. So when it’s time for grub we have food organised in a top Galway bar. Have a round of shots and a reserved area in a top Galway bar. Because we know it’s now time to turn the night up a notch. Later in the night we have entry and shots organised for your group in a top Galway nightclub.